An explosive young star with plenty of name recognition, Todd Gurley has emerged as one of the top backs in the NFL. 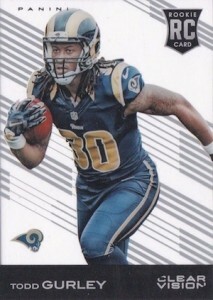 Already one of the key collecting options from the 2015 draft class, Todd Gurley rookie cards are primed for some big growth if he remains healthy and productive. 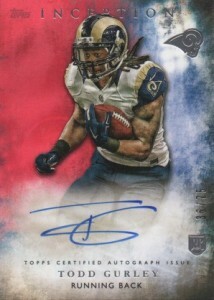 Drafted in 2015 by the St. Louis Rams (now Los Angeles Rams) with the 10th pick, Gurley finished his rookie year with 10 touchdowns, over 1,100 rushing yards, a Pro Bowl invite, and the AP Offensive Rookie of the Year Award. After a down year in 2016, things picked up again in 2017 and 2018, and the Rams even started winning thanks to the offensive success of Gurley and quarterback Jared Goff. 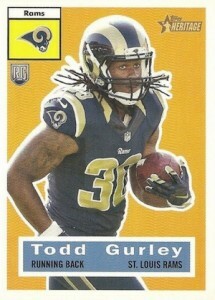 Shop for Todd Gurley cards on eBay. 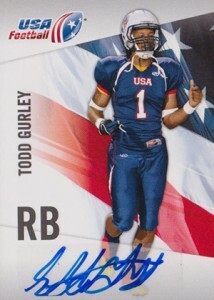 While his official rookie cards were not issued until 2015, the earliest Todd Gurley cards came from Upper Deck in 2012 thanks to his participation with USA Football. 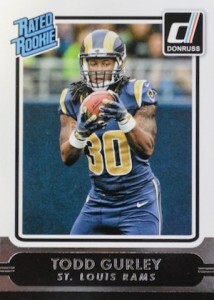 The following list includes the main Todd Gurley rookie cards from 2015 NFL products. 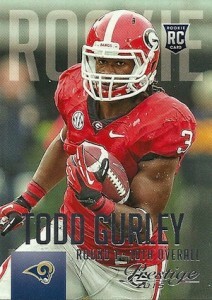 Below the rookie cards, Gurley's top college-themed and pre-rookie cards are covered. Click on the images or player listings to shop for cards on eBay. Bolded set names go straight to detailed profiles. 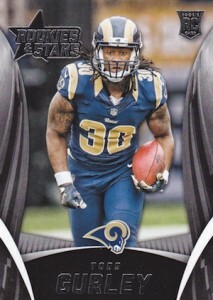 The basic look and airbrushed image do this 2015 Bowman Todd Gurley rookie card no favors. There are much better budget options than this forgettable card. Tapping into the nostalgia for the Rated Rookie brand, this simple RC from 2015 Donruss is given a little personality with a foil nameplate. A wrapper redemption exclusive offers a college version with a holofoil finish. 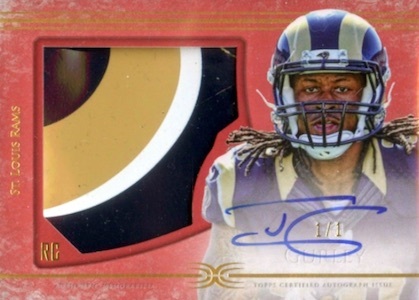 The all-autograph 2015 Donruss Signatures Series set is very deep, making the signed relic cards for Gurley tough to track down. Although the cluttered design and sticker autograph is not amazing, the overall rarity should help it maintain decent value with collectors. While it can be harder to find, the limited base rookie in 2015 Black Gold won't set you back much. 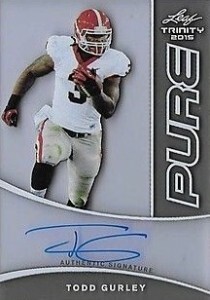 Gurley actually has quite a few choices in the set, including several signed cards. 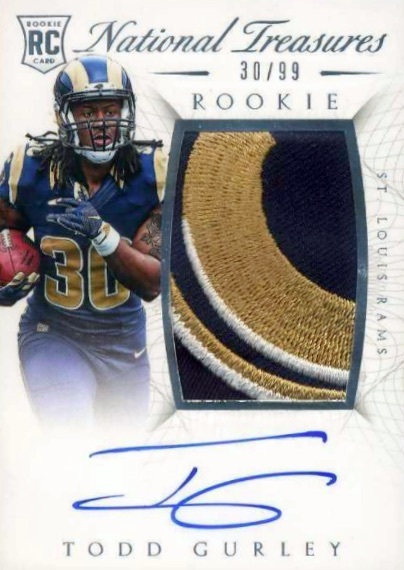 Featuring a loud design, the 2015 Certified rookie for Todd Gurley adds a jumbo patch and sticker autograph to make a solid mid-level option. The moderate print run keeps the card in decent supply. 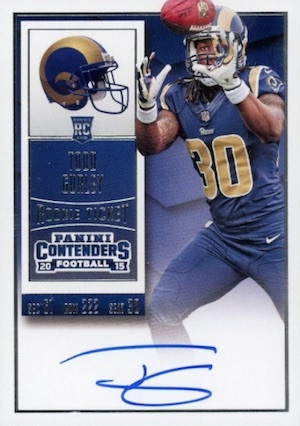 One of the top Todd Gurley rookie cards out there, the 2015 Contenders Rookie Ticket was originally issued as a redemption. The base version has a helmet image in the corner while the NFL image variation has just the team logo. There is also a third card with a University of Georgia theme. 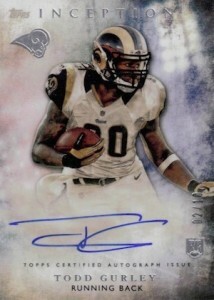 All things considered, 2015 Clear Vision provides a pretty nice rookie for Gurley in the same vein as Topps High Tek. The acetate design makes it stand out from the many base rookies and there is also a variation, shown on the right, that includes a different image and background design. 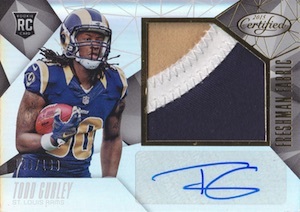 Although collectors had to wait on the on-card Gurley rookie autograph in 2015 Crown Royale, the base jersey relic was available from the start. The Silhouettes design has become a popular option in the hobby, making this a key choice for collectors. 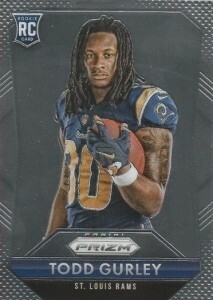 It might not be the most popular Todd Gurley rookie card, but it's tough to beat a real diamond and very low print run. 2015 Flawless has both along with cards featuring hard-signed autographs and premium patches. In addition to the base Diamond, numbered to 20, the Ruby version below has 15 copies, and there are also Sapphire (#/10), Emerald (#/5) and Platinum Diamond (1/1) editions. 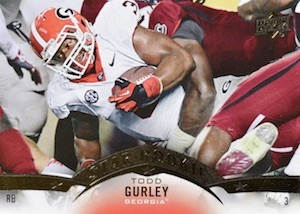 A frame and artistic image give the Todd Gurley rookie in 2015 Gridiron Kings a distinct look. Although the price tag is quite cheap, this is a great choice for collectors that are looking for something a little different. There are several limited parallels that switch the frame color and apply rarity. 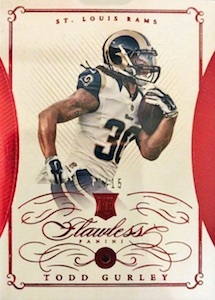 One of the best rookie cards for Gurley, 2015 Immaculate NFL offers everything collectors look for in a high-end RC. The quality design, on-card autograph, low print run and nice patch place it in a special class. Few high-end NFL brands have the hobby legacy of NT. Like Immaculate, 2015 National Treasures goes with a hard-signed card, print run of 99, and large patch. As the name indicates, 2015 Playbook is all about the booklet cards. 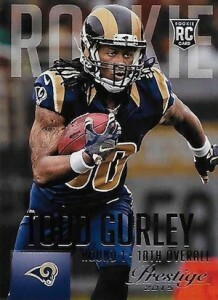 Gurley has several options in the main set, including base rookie booklets, jumbo relics, and signed versions. An NFL card with a college image is not the preferred option for most, but this 2015 Prestige rookie is still better than a generic photo where the logos have been scrubbed. 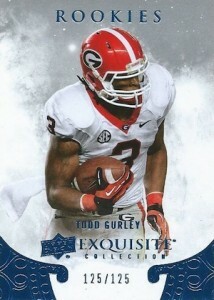 Prestige also included the NFL jersey as a variation for Gurley. 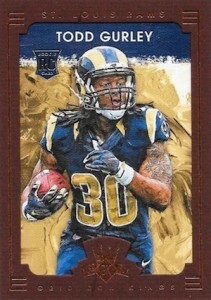 Something about the Rams' colors and the large silver frame really makes this Todd Gurley card sizzle. 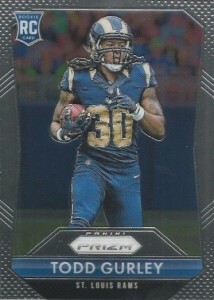 A solid budget rookie, there is also a limited variation in 2015 Prizm NFL that features a shot of Gurley without his helmet. 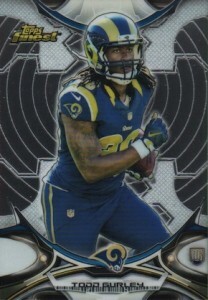 While the design is a little overwhelming, the Target-exclusive 2015 R&S rookie for Todd Gurley is a bit more accessible for casual collectors who don't have a local card shop. The shiny Crusade inserts are another popular choice in the release. 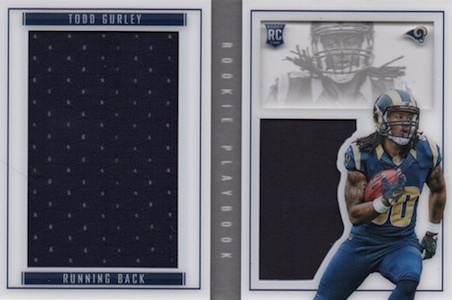 Both featuring a Refractor-like finish, 2015 Spectra has two base rookies for Todd Gurley, each with a different image. 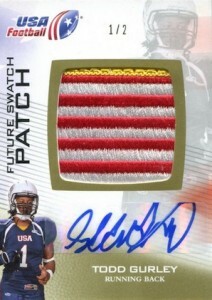 There is also an autographed patch card that is quite similar to his Certified rookie card, but with increased rarity. 2015 Score is known as a low-end option so it is hard to expect too much. 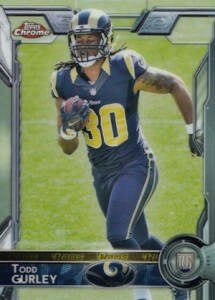 If you are okay with NCAA images, this is a suitable rookie card, but most want NFL photos. 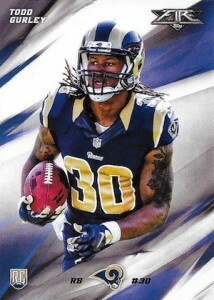 Another budget choice, the flagship 2015 Topps rookie for Gurley will always be among his most plentiful. Collectors looking for something a bit more limited can seek out the image variation where he is preparing to catch the ball. 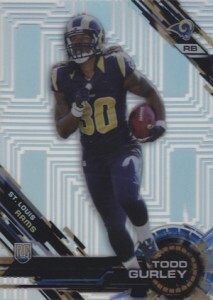 Acting as Topps Football 2.0, most collectors are aware that Chrome simply adds a quality finish to the flagship card. Also like the base set, 2015 Topps Chrome features a limited image variation. 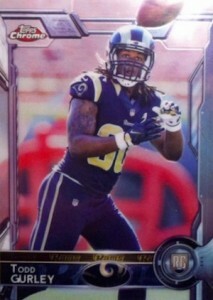 If you like Topps Chrome but prefer sizing variety, the 2015 Topps Chrome Mini card for Todd Gurley might be for you. While gimmicky and exactly the same as the regular version, minus the smaller dimensions, it does offer another inexpensive base card with a good amount of parallels to chase. 2015 Definitive goes heavy on quality with a horizontal RPA layout. While the patch is a nice size, the one negative is the awkward signing area. The Red Glove Logo version is shown below. 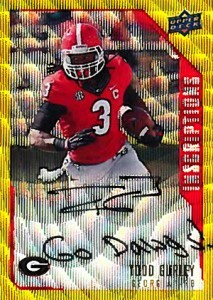 There are also several other on-card autographs for Gurley in the release. One of the final sets of the year, and one of the last Topps Football products before they lost the NFL license, 2015 Topps Diamond is a premium release. 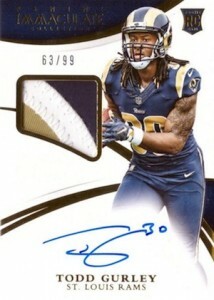 Originally issued via redemption, Gurley has nine different base autographs, plus an autographed patch card. 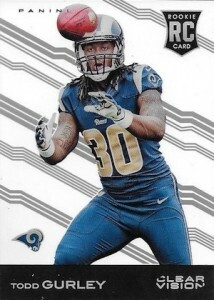 Featuring a heavy dose of silver, the hypnotic look of the 2015 Topps Finest rookie for Todd Gurley might not put all collectors in a trance. Still, the brand has a good following and the design does stand out. 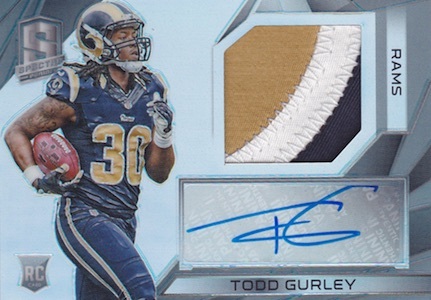 About as simple as they get, 2015 Field Access is another late-season product with a Todd Gurley rookie card. The very basic set also has an autographed version that adds a sticker signature to the main design. 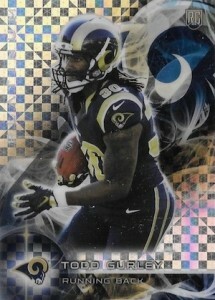 Like many of the Todd Gurley rookie cards, 2015 Fire replaces the background of the image with computer-generated haze. It is oddly appealing and those that like the designs in Valor or Inception should appreciate the Fire look as well. 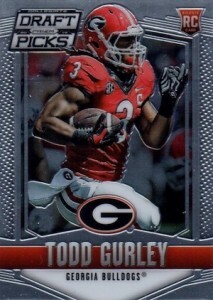 Part of a retail-exclusive release, 2015 Topps Heritage taps into the nostalgia factor with a simple base card for Gurley. 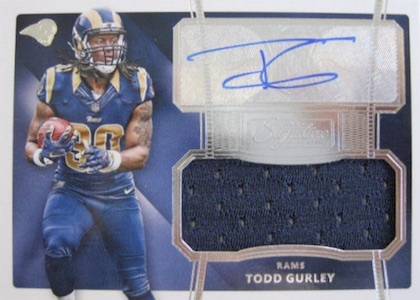 One of the more complex products of the year, 2015 High Tek offers several base patterns for Gurley and multiple parallels to chase. His signed cards feature on-card autographs but were issued in boxes as redemptions. There are also special promo versions that were found at the 2015 NSCC. 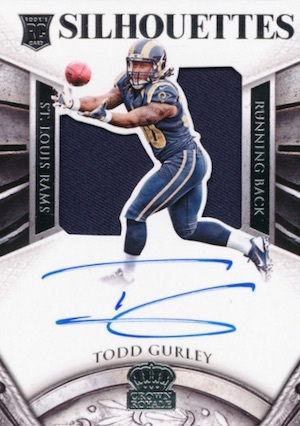 One of the most popular early-season options for Todd Gurley, 2015 Inception features an on-card autograph and appealing design. 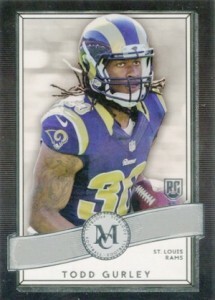 While many of the players also have a base version, Gurley is among the suspected short prints with only numbered parallels. A very limited variation can be found that swaps the image and only has 10 copies. 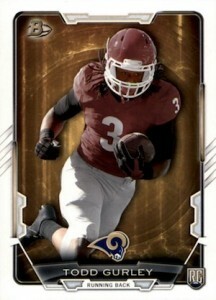 Simple and regal at the same time, 2015 Museum Collection contains a quality Todd Gurley rookie card that can still be found for very little. Basically Chrome with a little more personality, 2015 Topps Platinum provides a solid base card with a budget price tag. Also like Chrome, there are plenty of parallels to hunt down, including the Xfractor below. 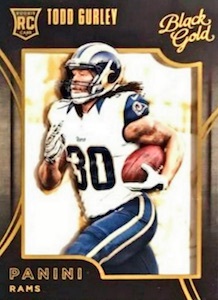 Even with two different versions, the 2015 Triple Threads rookie cards for Gurley are not the easiest to locate as they are both limited to 99 copies. Featuring a relic trio and sticker autographs, the look is a little busy but the overall rarity helps value. 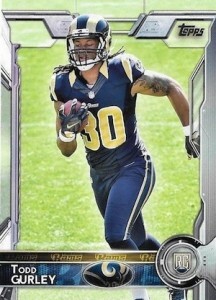 With a design that is similar to Inception, 2015 Valor is another Todd Gurley card that is inexpensive but still a little different than a traditional base card. 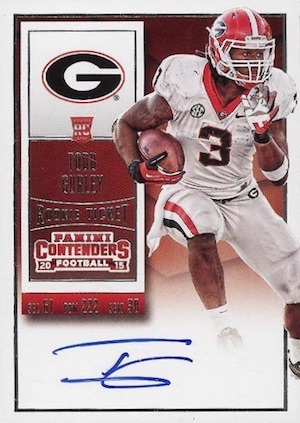 Featuring pre-college cards for Todd Gurley, including autographs and relics, 2012 Upper Deck USA Football is an early prospecting option for the dynamic back. There are not a ton up at any given point, but they are not especially rare either. 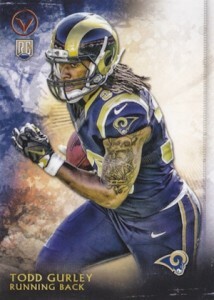 Classic and refined, the Draft Picks insert in 2014 Exquisite Collection included Gurley along with many other 2015 rookies. The limited print run and the fact that it is the last Exquisite football set for a while makes it a popular pre-rookie choice. 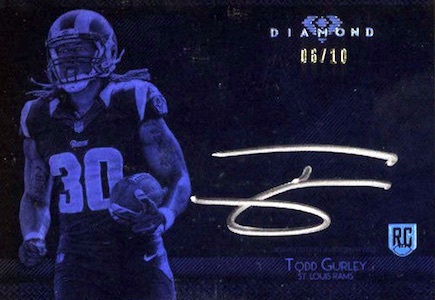 Leaf has multiple autographs for Todd Gurley that are found in their products, but 2015 Leaf Trinity stands supreme thanks to the high-end feel and brand recognition. On-card signatures further enhance the interest. 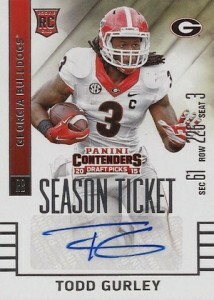 The college offshoot of the popular Contenders line, collectors can find two different versions of the Todd Gurley Season Ticket autographs showcasing him during his time at Georgia. 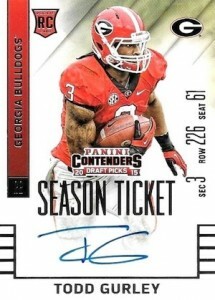 Based on information released by Panini, the base 2015 Contenders Draft Picks card, shown on the left, is limited to 250 copies or less, and the variation is capped at 50 copies or less. 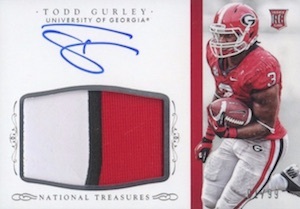 Part of the college spin on Immaculate, this Todd Gurley card is featured in the multi-sport 2015 Immaculate College set with both a signed version and the autographed patch card shown below. These are very limited with just 99 copies. Similarly, 2015 National Treasures Collegiate also takes a premium brand back to school. Originally issued as a redemption, it rivals any other college-themed card for top billing. 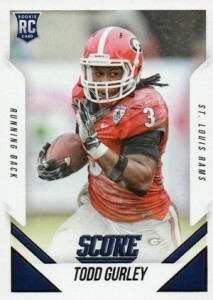 Like the Contenders NCAA card above, 2015 Prizm Draft Picks goes with a college theme on the base rookie for Gurley. 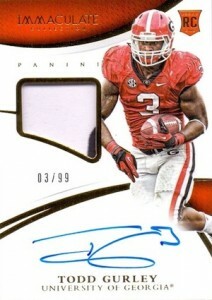 The red Georgia uniform really pops on this budget card and there are multiple parallels as well as some signed versions. 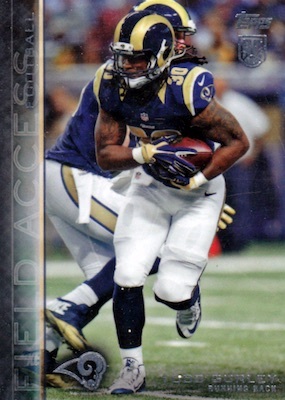 Celebrated for the action images, 2015 Upper Deck Football included two Todd Gurley cards in the base set and both are short prints. 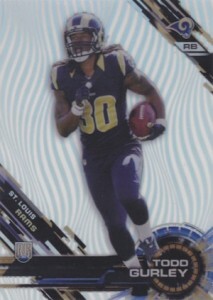 The card shown below is part of the main Star Rookies subset and there is also a retail-exclusive image variation. 2015 Upper Deck Inscriptions is a relatively simple release that features one basic design, three limited parallels, and a variety of inscriptions. 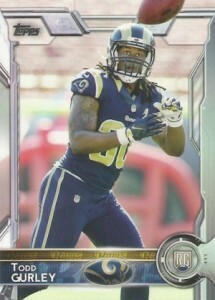 Gurley has a base Silver card along with a Red (#/49), Black (#/25) and Gold (#/10) parallel. 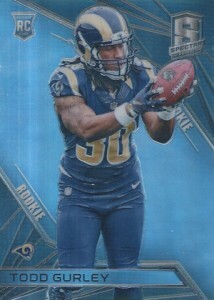 2015 Definitive FB #LBRAP-TG Todd Gurley Rams LEATHER RPA BOOKLET ROOKIE # 5 !!! 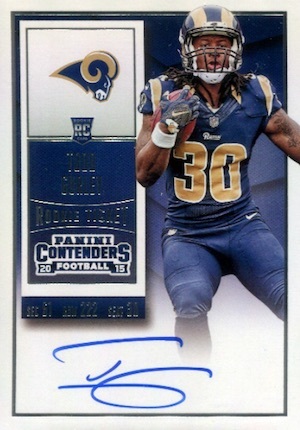 I’m trying to find information on a Todd Gurley 2015 Topps Certified autograph issue card. 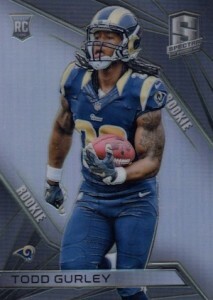 I couldn’t find it on your Gurley rookie card list or on eBay anywhere. It has TA-TG on the back and says Congratulations etc…. I could send pics. Just trying to figure out if it is rare or something.